Reinforce the value of radiographs as a diagnostic tool. Our brochure conveys the point that finding and treating dental problems at an early stage can save time and money and prevent pain. 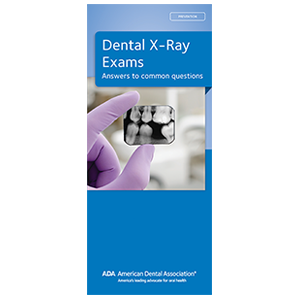 Features x-ray images; assures patients of the safety of x-rays and that dental offices take steps to reduce the amount of radiation to which patients are exposed. 6-panel brochure, pack of 50.